Note: The points hooks are a legacy feature of WordPoints that has been replaced by the new event reactions. The points hooks will eventually be imported to the new reactions, and the Points Hooks administration screen will be removed. 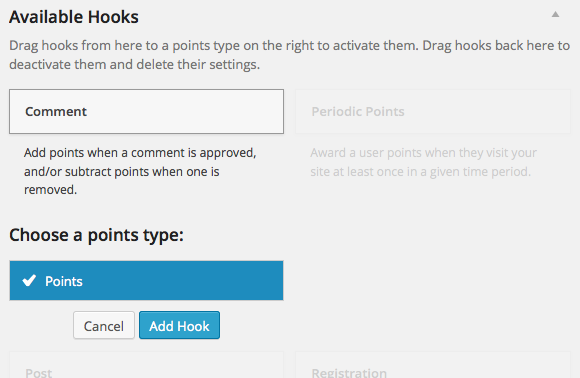 The points component of the plugin is configured to award points using hooks. Points hooks are attached (“hooked”) to an event, for which points are awarded. The points hooks are configured on the WordPoints » Points Hooks administration panel. The available hooks are shown on the left side of the screen. These are the different types of hooks, each of which hooks into a specific event, like user registration, or publishing a post. You can think of these as templates for each type of hook, which may be copied or “cloned” into the points types on the right side of the screen. This is very similar to the way WordPress provides different types of widgets on the Appearance » Widgets screen, that are cloned into your sidebars. A copy or “instance” of a hook does not award points until it has been configured and attached to one of the points types. You can create as many instances of one type of hook as you like. Each instance of the hook can be configured differently, and will award the type of points that it has been assigned to. To add an instance of a hook to a points type, you can drag its template from the left of the screen to the points type on the right. Alternatively, you can click on the hook template, and choose the type of points you wish to add it to. After you have assigned a hook instance to a points type, you can configure that instance’s settings. Below is a list of the available points hooks, with links to specific instructions for each one’s configuration.